In a non-reactive bowl, combine all ingredients and refrigerate overnight, covered. Transfer the mustard mixture to a blender and process until mustard has obtained the desired texture and thickness; it is equally delicious whether you leave it chunky or smooth. Store in an airtight, non-reactive container in the refrigerator for up to 2 weeks. I have actually made this before, but I always lose the recipe and have to find it again on Homebrewtalk.com. I thought I would put it down here so I can keep it. This will be for Mocktoberfest in September. The brine gets boiled and cooled slightly. 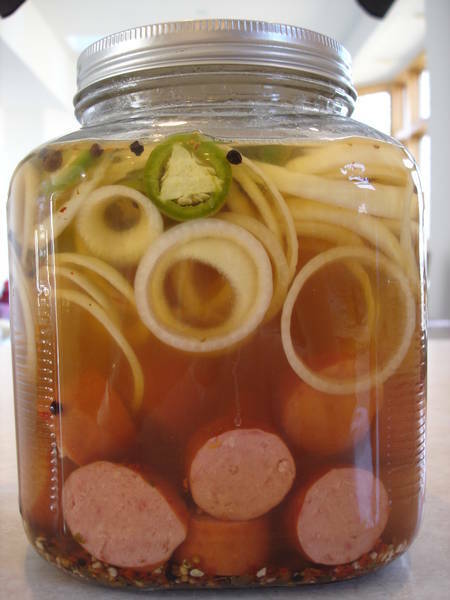 Then layer, sausage, onions, jalapenos, garlic (2-layers) in a large gallon size jar. Then pour the slightly cooled brine over the pickling ingredients. Credit to Homebrewtalk.com for the picture.